Here are my first two versions of the 1911 corset, for two very different figures. This striped version, deceptively displayed on a much smaller dummy, is for a lady of a completely different shape. She has a shorter torso and more curves. 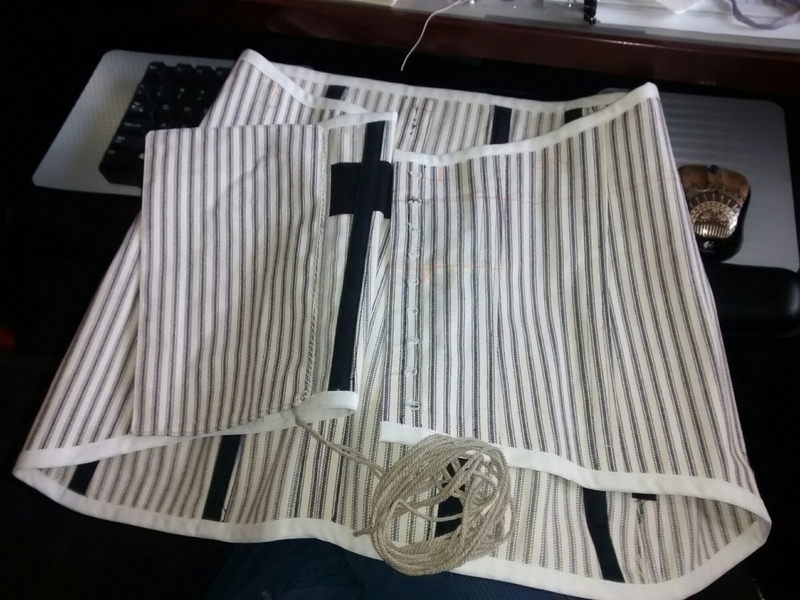 It has lacing bones, which are panels with heavy interfacing and grommets and 1/2″ spring steel bones that I can quickly sew into any mockup for fitting purposes. 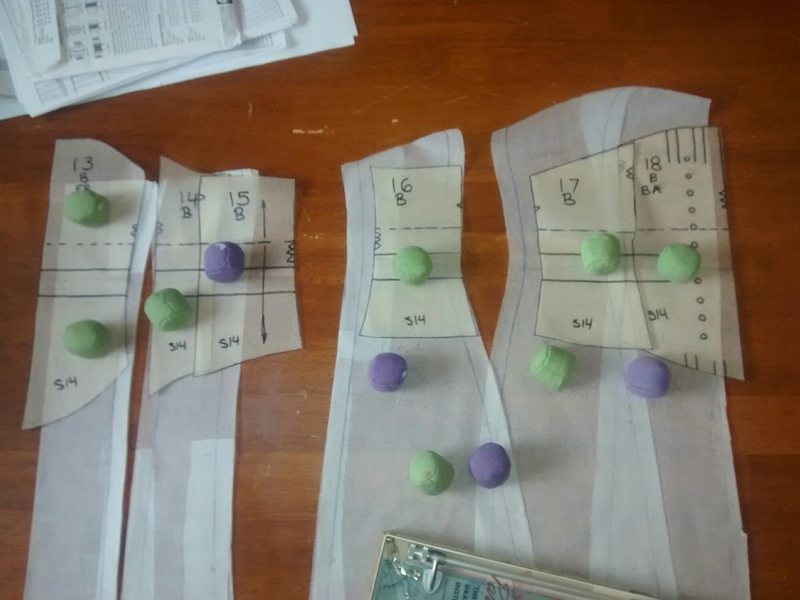 The green version is from the earlier pattern comparison with the Laughing Moon Victorian underbust corset. This figure is closer to the dummy, longer and narrower. It is worth noting that, to achieve the 2″ (5cm) gap in the back, you need to subtract 2″ from your measurements before you choose your size. More if you have more squish factor. On both versions I notice that the under bust portion is far too big around. Both figures have narrower underbusts than waist measurements. I’m not sure why it would be designed larger there, except that perhaps the ideal was still more Victorian. The UB to waist ratio decreases as the overall size gets bigger, but at no point (to the modern figure? Or at least my two test subjects) do those changes seem logical. The stripped version actually has a change in proportion in response to that issue. Overall I extrapolated through size 66. Contact me if you’re interested in my spreadsheet or how I applied the increases. Per the results of the green version I’ll be applying some decreases to that version next. 4. 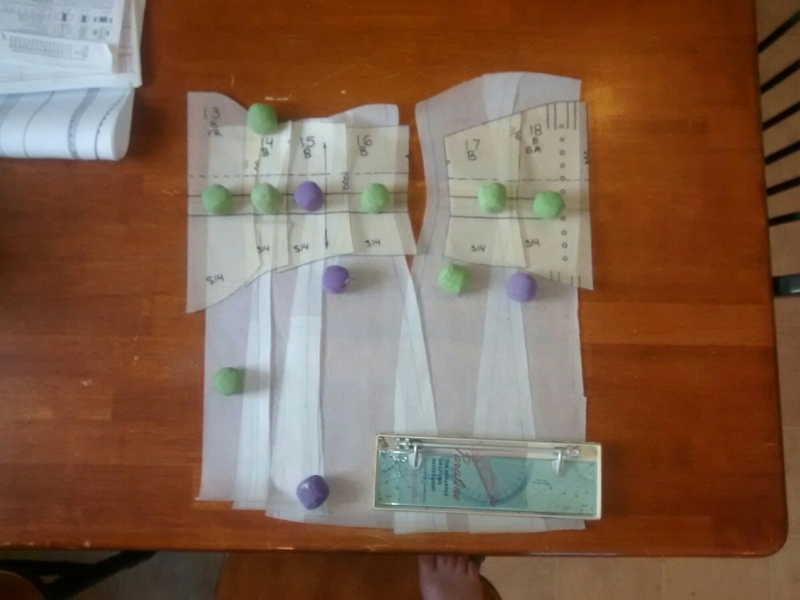 Last, and biggest, I’ll be decreasing the width of the back pieces 2″ (it’s going to be front and back opening) and will be decreasing the seam between the first and second pieces maybe 1/2″ at the bottom, which will change the pieces shape a little. The last has more squish factor. None of the changes will happen in that order. 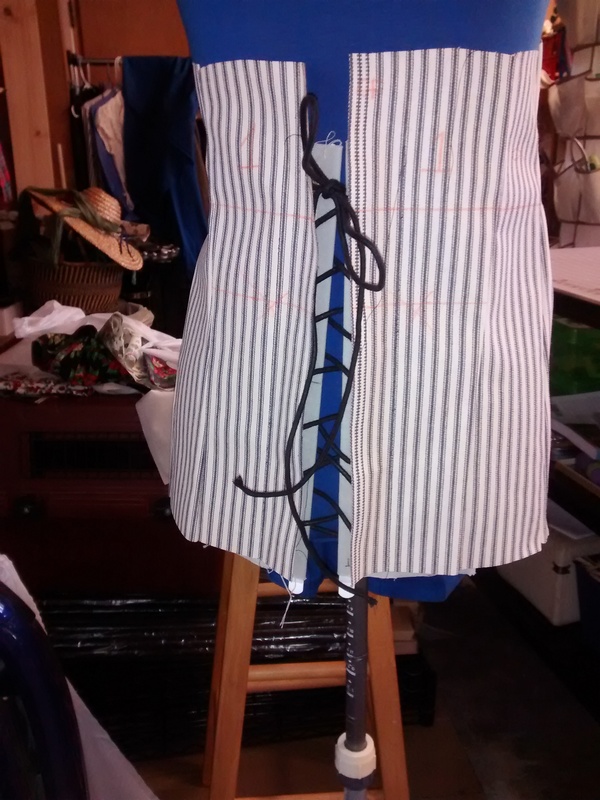 A couple other notes: This corset is being made in heavy ticking. It’s not meant for this kind of garment (or any garment), but with its tight weave, it’s better than denim. It isn’t better than coutil, but time is of the essence here, so we’re doing this quick and ugly. The boning is going to be a little random; whatever I have on hand. She wants a front busk and I think I have one of the correct length, but if not, we’ll have to lace. I’m planning to use buttonholes instead of grommets. We need to keep the holes small to give a smooth look, but small grommets tend to be wimpy. 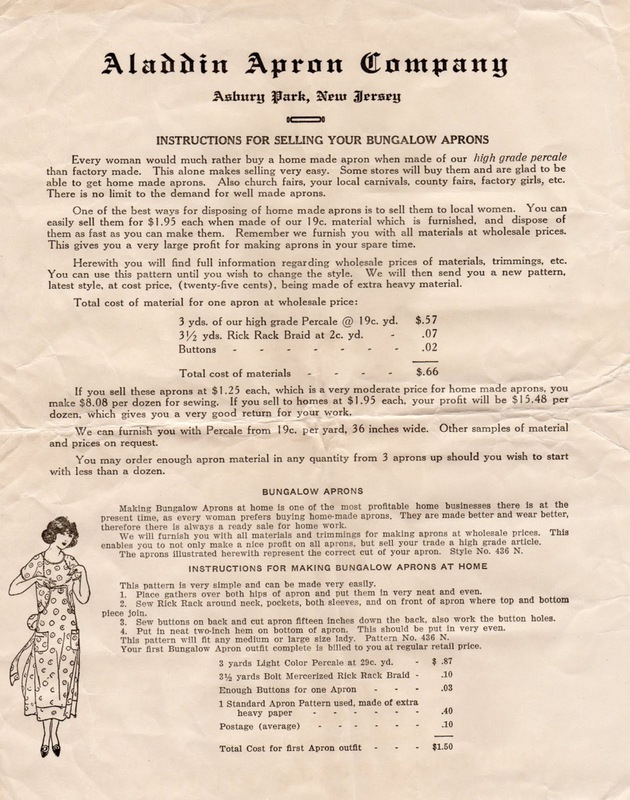 These patterns are the 1911 corset from Bridges on the Body and the Laughing Moon #113 from 1900-09. First, the caveats: 1. this is an unfair comparison – sort of. 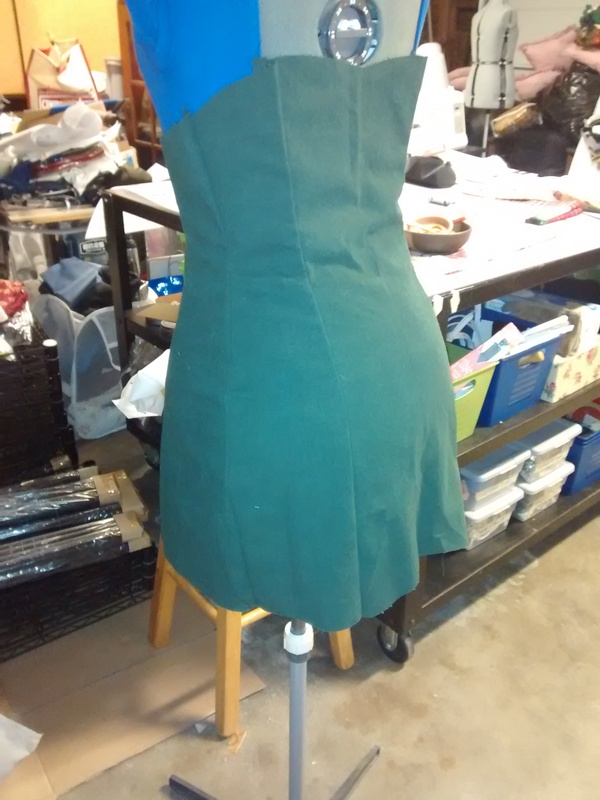 The two patterns are clearly very different garments, but both are under bust corsets of sorts, 2. The two patterns aren’t quite the same size. 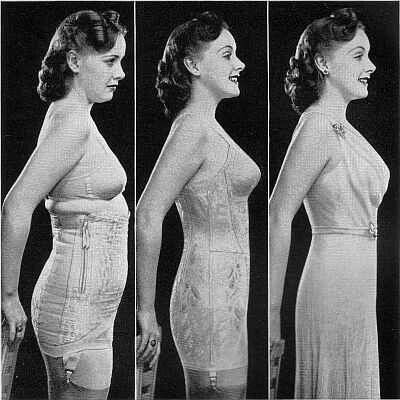 The bottom (1911) is larger by almost two inches at the waist and hips, and 3. 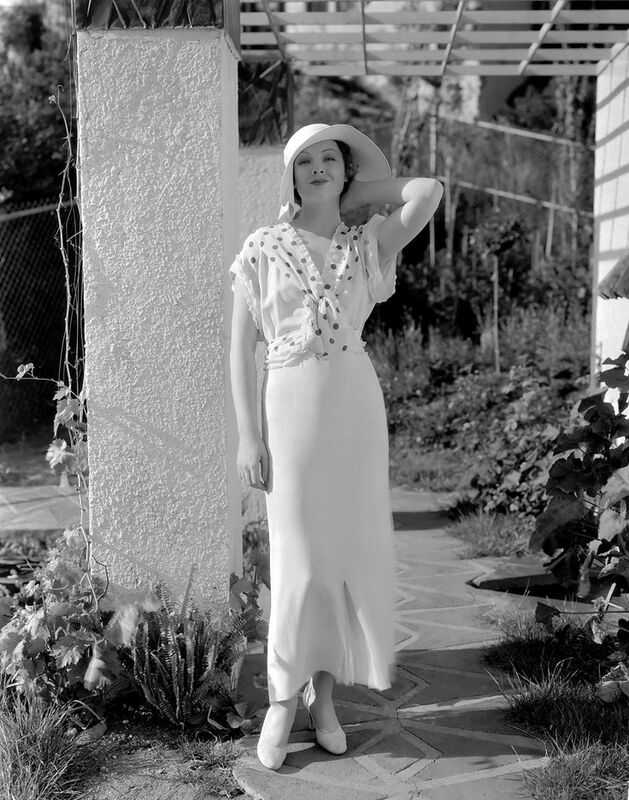 The bottom pattern does not currently include a seam allowance at the front or back. 4. I have the back piece of the LM to far too the left. The grommet holes are in the solid fabric of the 1911. I’ve made the LM several times and like it overall. Being a waist cincher and having only one set of curves, I consider it a good basis on which to judge other similar garments as I did with an Elizabethan corset here. Focusing on the back pattern, the 1911 which is new to me, what am I noticing in the two patterns? 1. The 1911 is quite short in front top and rather tall in back. Since I personally find the LM to be short, this is going to be a problem. 2. The 1911 is really long at the bottom. Something like 19″ overall length at this size (a 42 waist / 44 hips, which translates to about 30″ waist / 40″ hips). You aren’t seeing the suggested boning placement. I’d say they are similar in length to a typical Victorian corset. This leaves quite a bit of material as a form-fitting skirting piece, which should make for smooth lines. I’d say this will go all the way past my bum. 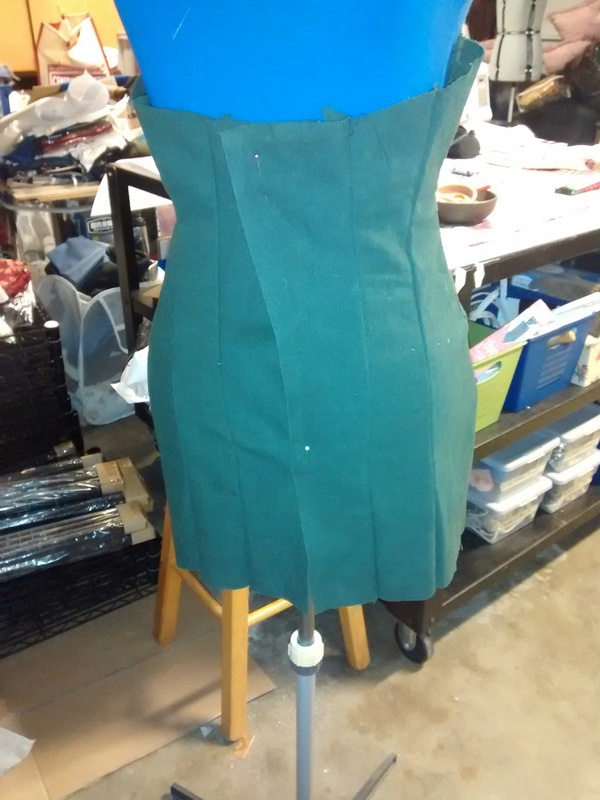 The unboned skirt will be about half the total length. 3. I don’t know where they are measuring the hips exactly. Logically it should be where the pattern looks largest, but logic doesn’t always prevail. The fact that I had to make my usual one size jog between waist and good tells me it’s probably going to work for me. 4. The individual piece shapes look logical to me and match those of the LM reasonably well. 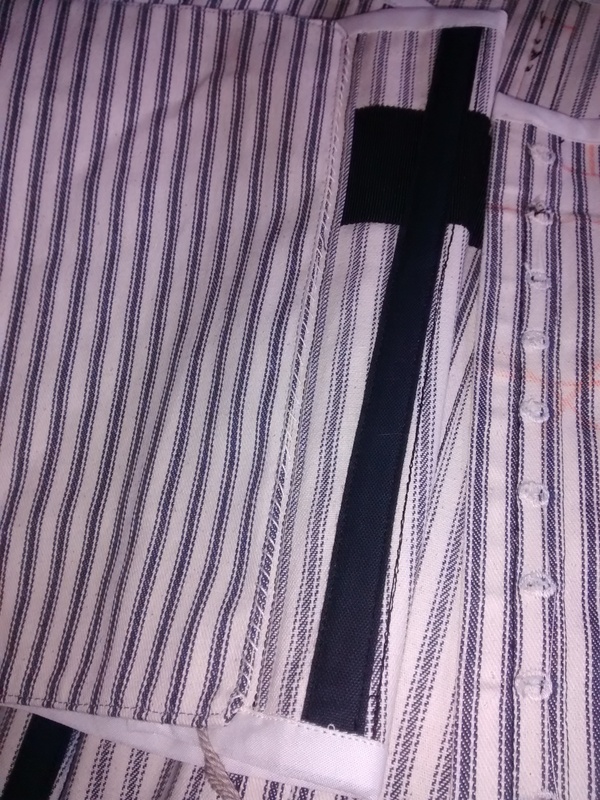 There are two pieces in the back, a sort of side-front and two fronts. The skinny piece next to the front on the LM (which you can see lapped by the third in the image above) never made much sense to me, but might if it were a full corset. 5. 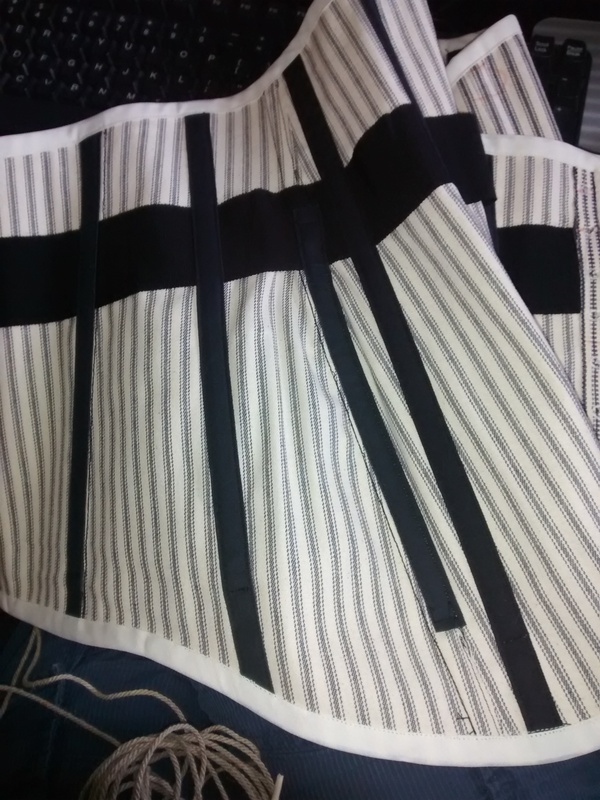 There is a busk in the front, but it looks like the back could either go solid and non-opening (which i don’t think they did) or have traditional lacing. 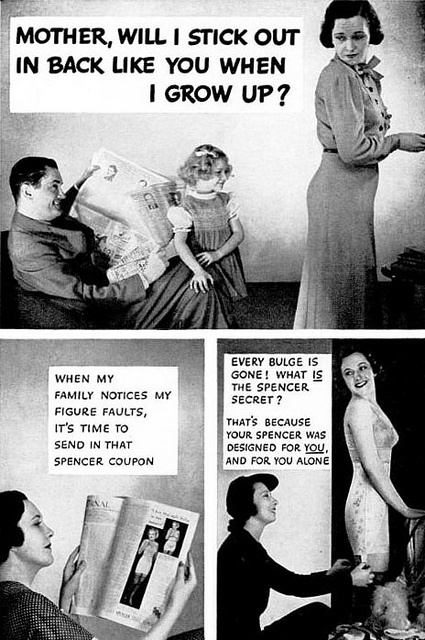 Of course I have and to complicate things and I won’t be content to make the garment as is. 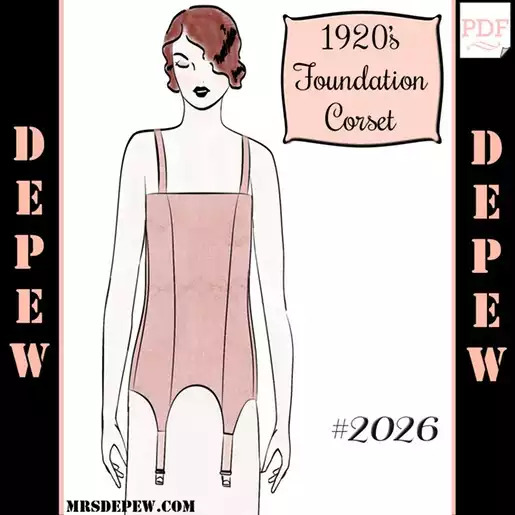 My plan is to use this as the basis for a 1930s corset. I will be making it up in coutil with power mesh inserts. Next step – a mock up.